By extension also the subsidy pushed sales and regulations on other products, from buildings to cars to washing machines, measures based on energy consumption rather than product safety, as used to be the case. The links are mostly to the Ceolas.net site that accompanies this blog, a site deepening the arguments, but also providing external and official references (direct links to governmental energy department data, US/EU official statistics, institutional research especially from USA, Canada, UK, Germany and other European countries, along with links via other sites, communication and document copies) - and providing more relevant ways to achieve the desired goals, in energy efficiency, in general emission reduction (CO2 or not), and in how innovative new bulbs are properly encouraged. "Hey, the Economy is still in deep trouble, and you worry about Light Bulbs?!" Oddly, a lot of such critics supported the regulations in the first place - why, if the bulbs are irrelevant as an issue? Besides, since people spend half their lives under artifical lights, one could say that such regulation affects them more than most other regulations. The psychological and well-being effects of lighting should be remembered in this context. About the questionable "feelgood" necessity of token sacrifices to "save the planet", especially when governments are dealing with the energy and emission issues related to electricity generation anyway, handily ignored when the same government departments project old emission data 20-30 years into the future so as to hail the suitable multimillion ton figure thereby arrived at. Finally - and ironically - those (generally on the left) who make such criticism and keep saying the economy matters more, are the very ones ignoring that with bans they get nothing, whereas with a tax on around 2 billion annual sold relevant bulbs (in the US, as in pre-ban EU), they get plenty for their public spending, which in helping to pay for their price-lowering subsidies on alternative products don't "just hit people with taxes" either - albeit, as covered below, that market competition is a better policy. What is at the heart of this ban? A subsidised and enforced worldwide replacement of unprofitable patent-expired simple, cheap, well known, safe, and easily locally made bright broad spectrum light bulbs in an odd coalition between global capitalist manufacturing executives, left-leaning governments, and environmental organizations. Increased - not decreased - competition leads to the manufacture of desirable products. In "stimulating innovation", bureaucratic committees that define "progress" by setting arbitrary permanent product energy usage cut-off points still have to take into account what exists - or people might be left in the dark. Energy saving Fluorescents and LEDs: Already invented in the presence - not the absence - of cheap incandescent competition, just like all other desirable energy saving inventions, and their improvements, throughout history. Individuals can always voluntarily make energy saving choices, although their overall money savings are much less than supposed, for several reasons. But society energy saving laws, if needed at all, should of course be about society energy savings, not what light bulb Johnny wants to use in his bedroom! Even the gross society energy usage savings (before reducing factors) are a fraction of 1%, or around 1% grid electricity, from Department of Energy data backed up by referenced institutional American, European and other sources, savings that are still less on described time-of-use, heat replacement, life cycle and other considerations. is about increasing the efficiency of generation and grid distribution (coal generation typically 35% energy efficient), from coordinated grid management with increased service provider competition to keep down energy use and cost, rather than any token feel-good-to-be-doing-something light bulb policy. Even considering home consumption, there are many more demanding heating, cooling and other electricity uses than lighting. Unnecessarily leaving products on is a "waste" of electricity. The personal choice of what product to use, by those paying for that use, is not a "waste" of electricity. One can understand the good intention behind light bulb regulations, and indeed agree with the overall objectives, without agreeing on the method used. Energy efficiency regulations (on light bulbs or other products) are the wrong way to go about achieving energy savings or better bulbs, and the arguments used to defend the regulations are misleading. 1. "This is not a ban!" "You will still be able to buy similar incandescent light bulbs!" "The Secretary of Energy shall report to Congress on the time frame for commercialization of lighting to replace incandescent and halogen incandescent lamp technology"
EISA phase 2 beginning after 2014 (which ban proponents never mention) will as seen from the 45 lumen per Watt regulation come to ban the now touted 72W incandescent halogen type replacements for 100W bulbs, and so on for other wattages. Similarly in the EU and Australia, progressively greater bans from the progressive standards set. Setting standards that do not allow certain bulbs is obviously the same as banning them, even if it politically sounds more suitable to "phase them out"! The fact that some citizens for now can get round the regulations by buying "rough service" varieties intended for industrial use, does not of course take away from the regulations in themselves. "Yes it is a Ban"
The Halogen and other replacement type incandescents have already existed for some time, and are not popular with either consumers or politicians, as they cost much more for marginal energy savings, so politicians have not pushed their use with subsidies etc as with "energy saving" fluorescent bulbs (CFLs). The replacement incandescents also have differences anyway, in light quality, in running hotter, and so on, compared to traditional simple incandescent bulbs, and in the EU the most popular frosted types are already banned. Finally, one has to be aware that the manufacturers supporting the ban would hardly seek to further improve incandescent technology, given the more profitable alternatives, as covered in a later point. 2. "Efficiency standards mean that better products using less energy will be made!" Efficiency is not just Energy Efficiency. The targeted most popular "inefficient" incandescent light bulbs are highly efficient in terms of achieving bright high quality full spectrum light from a simple construction using few component resources - unlike the pushed complex Fluorescent or LED alternatives. And there is no free lunch. Restricting the energy usage on buildings, cars, washing machines, TV sets or light bulbs always alters their characteristics: in construction, appearance, usability and/or performance as well as price. Energy saving is therefore not the only desirable product quality. It is one of many desirable qualities that can positively be marketed - without bans. Incandescent light bulb advantages compared to CFLs or LEDs? Simple to make, with a smooth broad light spectrum output, and a generally acknowledged pleasing aesthetic appearance, including in clear, transparent forms. They are versatile with dimmers and sensors, are quick to come on in the cold, and are particularly easy to make bright, including in small sizes - hence the particular irony of early bans on 100W type bulbs. Simplicity and versatility go together. CFL types with dimming capability are particularly complex and expensive, and dimming gives an eerie glow compared to the increased reddish warmth of incandescents, while even more complex driver-driven LED dimming ironically increases "power factor" energy waste, with correction adding to cost (US Energy dept admitting LED dimming issues here). The complaints of elderly people about dim "energy saving" bulbs is particularly understandable since eye lenses yellow with age, making them absorb the greater blue light component of such bulbs, and therefore those replacement bulbs appear even dimmer, coming on top of the ageing process which itself increases the need for bright light. Better products, whatever the characteristics desired, arise from increasing - not decreasing - competition on the market! This therefore includes better energy saving products, as covered in further points. While supposedly furthering progress, the standards must anyway be set so that replacement products already exist. Otherwise, with light bulbs, people might literally be left in the dark. Halogens, CFLs, LEDs - all invented before any ban. The real issue is therefore of people making the "wrong choices" of what is available. Supposed "big savings" only arise from banning what is popular. 3. "People won't buy CFLs or LEDs because they are too expensive! People are too stupid to understand energy savings!" Consumers don't repeatedly buy cheap products that don't meet their expectations. Nor do they avoid buying expensive products that can give them future savings. "Expensive to buy but cheap in the long run"? From woollen suits to batteries and washing up liquids, durable expensive products are marketed and sold against cheap alternatives. Think of Energizer (Duracell) bunny rabbit commercials! It is the presence - not the absence - of cheap alternatives that stimulates manufacturers to make better energy saving products, products that people actually want to buy. Ironically, this notion of uninformed consumers making the wrong decisions has been at the basis of several "switch your bulb" type energy saving campaigns and new information labelling of light bulbs and other products after rather than before bans, as in both the USA and the EU. After all, such increasingly informed consumers should by themselves make "better" decisions in line with governmental desire, buy more energy saving products, and reduce the "need" for a ban. Anyone still wanting the old bulbs might have good reason for it, in line with their listed advantages, while causing little if any energy usage increase overall, for the later described reasons. July 2012 Virginia university research: Consumers are not irrational, and environmental savings are negligible. For those who nevertheless insist on there being a "market failure" from stupid consumers preferring cheap bulbs, then, as described below, taxation of incandescents which can cover price lowering subsidies on the CFLs or LEDs obviously "evens out the market" in terms of bulb prices (albeit a policy unjustified of itself). 4. "The expensive CFL and LED bulbs will become cheaper after a ban, on economy of scale!" It may seem natural to expect that greater sales means cheaper bulbs. Firstly it does not necessarily hold on supply and demand. Having removed the other bulb choices, there may be insufficient supply for the new demand. That raises rather than lowers prices. Secondly, it is irrelevant how many bulbs are sold, in that manufacturers / distributors / retailers simply charge what they can. Since the cheap competition has been removed, and since there are fewer manufacturers of newer more complex bulbs, there is less pressure to reduce prices (besides which light bulb manufacturers have a history of cartels). Thirdly, on the Government side, pre-ban price lowering subsidies (as in North America and Europe eg http://ceolas.net/#californiacfl onwards) are no longer seen as so necessary. new technology compared to patent expired old simple bulbs. As with all other patented products (compare with pharmaceuticals) the price is higher for the duration of the patents. CFLs and LEDs contain rare earth elements, the price rise in recent years giving an increase in their prices, as covered in 2011 news reports. Also they are mostly made in China, where wages are rising, and shipping transport fuel cost has also risen in recent years. Finally, CFLs (and possibly LEDs) will be subject to increasing recycling mandates on manufacturers and retailers, which will again add to consumer purchase cost. In comparison, incandescents are of course more simply and often locally made, and have no recycling requirement. 5. "Surveys show that people welcome energy efficiency regulations!" "People will like CFL/LED bulbs when they actually buy them!" "Great similar LEDs are now available!" A USA Today poll showed most people welcoming regulations and liking energy efficient lighting alternatives, while a Rasmussen survey showed that most people thought it was none of the government's business what light bulb they use. To some extent it obviously depends on how questions are asked. The first obvious answer is that if people think the alternatives are so great, why haven't they already bought them in sufficient numbers then? Standard light bulbs remain the most popular choice. The second obvious answer is that if people think the alternatives are so great, there is nothing stopping them buying them - it does not necessitate banning other light bulbs. Indeed, if happily buying the "great new bulbs": what in that case is the point of banning bulbs that presumably in that case won't be bought as much, and so give (even) less energy savings - but might still have a welcome use for the few who do want to buy them? Banning popular light bulbs is questionable. Banning unpopular light bulbs is equally questionable. As it happens, from consumer surveys (including the USA Today poll), most people have in fact bought and tried alternative fluorescent light bulbs (CFLs) - but don't use them for all their lighting. The "switch all your lights" campaigns do not recognise the valued different uses for different types of lighting. Hot or cold ambience, vibration, dampness, enclosed spaces, recesses, existing dimming circuits, timers, movement sensor switching, use in chandeliers and small and unusual lamps, aesthetical use if clear bulbs are preferred, rare usage when cheaper bulbs are preferred - and so on - apart from light quality differences, particularly noticeable when dimming. Usage in children's rooms might be restricted on breakage and mercury release issues, see point 12 below. LEDs offer an alternative choice especially for directional lighting - but otherwise, with several similar location and usage issues to CFLs (especially the newer phosphorescent "white" LEDs), as well as having their own light quality issues in uneven emission spectra. LEDs also have even more light output problems than CFLs to achieve bright (75-100W and over) omnidirectional lighting equivalence, and at reasonable cost. 2014 has seen the USA Dept of Energy's own lighting program manager come up with a surprisingly candid 12 point analysis on "lessons learned" in driving the replacement of incandescents with LED bulbs (also known as SSL, solid state lighting). "Many additional lessons could be listed, but this report focuses on areas where ongoing challenges exist and/or useful information can be applied going forward"
The health and safety aspects of the lesser known CFL and LED usage are of further importance, as people spend much time near them. This includes less easily defined but nonetheless equally important biological/psychological effects of lighting. See point 12 on safety/health below. "Progress" is not a 30-50 dollar/euro unsubsidised price of a complex LED clone of a simple incandescent bulb. LED technology is optimal in sheet form. Hardly surprisingly, that is also how they were first used. Fluorescent and LED lighting technology do have some applications in bulb form, but are compromised in trying to replace what incandescents can do - as with all the "revolutionary" expensive fixed color temperature incandescent-copying LED bulbs now flooding the market, backed by likewise expensive research taking away from alternative application development. "They impose what seems Efficient, they forget what is Effective"
The notion of people liking and using future alternatives, including future LEDs (and OLED sheet type lighting), also questions the need to continue any existing ban on incandescents, even by pro-ban governments. Compare with the vacuum tube example in point 11 on Standards, below. In other words, if the "habit spell" of buying cheap incandescents has been broken and new lighting is appreciated, then a ban could be lifted at least on a trial basis (perhaps replaced with taxation), allowing the continued use for those who still seek out incandescents. Indeed, the EU set out a number of requirements that replacement lighting was supposed to fulfil. As seen, any neutral observer would be hard put to say that those conditions have been met. Perhaps the EU people would like to remember that, in their planned 2014 review of the ban. A further reason to rescind bans, or gradually "unphase the phaseouts", is that more and more future energy will be infinitely renewable and of low emission - why should such energy users be denied product choice? 6. "We save a lot of energy and CO2/mercury emissions with this ban!" To win popular support, politicians keep saying how much Household saving there is with a ban, of which more later. But it is hardly politically relevant to worry about what light bulb Johnny uses in his bedroom! Society energy saving is what matters - albeit even then that renewable and zero emission energy, as increasingly deployed, will more questionably warrant restrictive mandates on consumers. Using official European Commission VITO data, this comes from the Cambridge University Network under Sir Alec Broers, Chairman of the UK House of Lords Science and Technology Committee, Scientific Alliance section, reflecting the views before and since the light bulb ban announcement of Physics Professors and other scientists from several institutions, similarly with other referenced university energy department communications from Canada, Germany, and Finland (more). Political decisions don't necessarily have the backing of independent scientific research - but scientists are less politically vocal than well meaning but misguided environmental activists or profit seeking lobbying manufacturers, of which more later. Worldwide environmental campaigns, as by Greenpeace below, are said to have been the initial catalyst behind banning bulbs, and - to give them their due - they have been very successful in emotionally pushing politicans and consumers to "do the right thing". For dramatic effect, as in the USA and the EU, the savings have therefore often been expressed in terms of the multitude of coal power plants and millions of tons of CO2 saved with a long term view (eg to 2030). Also, note how politicians simply project old CO2 and mercury emission data into the future - ignoring the many changes in energy delivery and emission reduction that the same politicians say they will implement! Besides, notice how any assumed "big savings" only come about by banning what people would have bought if they could! No "big savings" from banning what people don't want to buy! - whether or not one agrees with the need to reduce man-made CO2 emissions in the first place. Most incandescent type lighting is used off-peak after 7pm, when power plants are not used to their capacity anyway, so the idea of saving power plants goes out the window - and it's back to telling Johnny he can't use what bulb he wants, even though the energy infrastructure is there and under-utilized, with surplus electricity for whoever wants to use it. This applies whatever energy source is used to generate electricity, and is the reason night electricity is cheaper for many households and most industry. alternative energy supply, grid distribution upgrades, smart grid systems, and in alternative consumption savings. with around twice the CO2 emissions of either natural gas or oil in equivalent electricity generation. Light bulbs don't burn coal, and they don't release CO2 gas. Power plants might - and they might not. And if they do, then coal and its emissions can be treated in various ways. Relevant domestic lighting is mostly used from 5pm onwards, especially evening and night after 7pm in the temperate zones that include most industrialised countries: Dept of Energy (DEFRA UK) Intertek research (pdf). Basically, where coal plants are the main constant source of electricity, their operatively justified night level output more than covers any consumer electricity demand at such times - which is also a reason electricity is so cheap then, on time-based pricing. Turning them down any further to account for any "incandescent saving" would never be done on basis of operative costs, including wear and tear and slow reheating for higher daytime use. And that is for relatively modern coal plants with "cycling capability" - old types as in Eastern Europe have even higher nighttime levels to save on daytime upturn. Burning excess coal is much cheaper than plant maintenance, especially with the older plants. This alone makes a farce of banning light bulbs. Once again, the notion "put 2 bulbs beside each other and see which uses most electricity" misses the overall situation. The Irish Commission for Energy Regulation has a good overview (pdf) of power plant cycling issues. More specifically covering coal plant cycling issues, Nov 2011 APTECH engineering (CA, USA) coal plant day - night cycle study here, covering the many problems of turning coal power down and up. April 2012 detailed update. Also, an XCel study for Colorado Energy services into shifting between wind and coal power, and coal cycling implications, favoring shallow cycles (not shutting coal down too much) rather than deep cycles. In electricity output analysis, it may appear that coal plants have been suddenly turned off when switching to other sources "saving lots of coal and emissions". This is therefore not true - coal is still being burned, still releasing emissions and in effect being wasted. But it allows lower emissions figures to be stated for the grid operator or government! All-in-all, no society reason to stop Johnny using what bulb he wants in his house, a bulb choice which of course maý have advantages for him whatever the cost thereof, voluntarily paid (and at lower night rates in many countries). limited coal use and emissions are caused relative to any electricity used. Peak times brings on quicker responding electricity generation, such as gas or hydro powered turbines, because of heating, cooking stoves and kettles coming on (rather than any lighting). Therefore, at such times, the light bulbs proportionally use sources with much less emissions than from coal. So even the fractional 0.33% energy saving of the EU related quotation hardly applies, and there is virtually no coal or emission saving. In overall generation and distribution terms this can be compared to commonly 30-35% efficient coal plants feeding grids with 6-8% transmission losses (USA, UK and elsewhere). Still, much more fun (and profitable) to indoctrinate kids to switch bulbs to save the planet. As it happens, CO2 and other gas emissions may increase by switching away from incandescent light bulbs, especially in cooler climates, as shown by linked Canadian, Finnish and Icelandic research, independently of one another (also see http://ceolas.net/#li11x). That is, when the electric light bulb heat from a low carbon emission (like nuclear, hydro, solar, wind) power plant source is replaced by CO2 emitting heat fuel (like coal, gas, oil). As with CO2, so with mercury, as both are predominantly from coal use: thus negligible mercury emissions caused by incandescents. That is otherwise a common and rather bizarre defence of CFL mercury by environmentalists (if there is a problem - deal with the problem). The end 2011 US EPA mercury emission reduction mandate of 90% by 2016 allowed for by recent reduction technology breakthroughs, and similarly recent Canada and EU mandates, deal with the emission problem anyway. I have - after years of research into this - yet to see a political intelligent replacement saving suggestion in the USA or the EU that simply does not assume that "replacing an x watt lamp with a y watt lamp gives x-y = z watt savings!". Real life seems to be an anathema to politicians, here as with much else. This rundown is restricted to some basic examples. Firstly, the incandescent heat effect: when it is dark it is often cold and heating is welcome, in most industrialized countries. As with much else, the fact that the heat effect is difficult to calculate for a whole country's variable households means it is just ignored. Nevertheless, as further covered in point 9, there is considerable research backing its effect. Secondly, the rebound effect: if a product is effectively cheaper to use, people will use it more. Again, hard to quantify, albeit that diverse follow-ups such as CFL replacements in an Iowa town and LED replacements in Asian businesses saw smaller than expected savings (and even cost increase). The particular fact that fluorescent lighting should be left on so as not to decrease lifespan also mitigates against supposed replacement savings. Thirdly, the compensatory effect: lowering the allowable energy use of a given product may affect performance, so an "energy efficient" vacuum cleaner may be used more, or more powerful versions bought, if available. In the case of lighting, the lab specified brightness of fluorescent and LED bulbs does not correspond well to eye sensitivity (and even less so with age, as yellowing eye lenses absorb CFL/LED greater blue light components), hence the common complaint of "dim" bulbs": 100W+ type omnidirectionality is particularly difficult. Where more powerful bulbs are not available, more bulbs might simply be used. This particularly applies to LED bulbs with directional brightness, hence how they are lined up in parallel - again making a mockery of bulb-for bulb replacement saving suggestions. So far that's only been about the energy and emissions of usage of lighting: which still does not take into account the additional higher lifecycle energy and emission use of CFL and LED lighting alternatives (mining, manufacture, assembly, recycling plus transport throughout). National governments may not particularly care about the energy use in making a bulb in China. But in professing how "national jobs are being created in LED industry", these considerations come into play also for them - as they obviously do for environmentalists in terms of fossil fuels, emissions and depletion of natural mineral resources. The energy use in the assembly of complex CFLs or LEDs is admitted on Osram and similarly referenced data to be 6-10 times that of incandescent bulbs, but that data still does not include the actual manufacture of the much greater number of component parts including the internal ballasts and transformers (http://ceolas.net/#li16x), also noting the extra emissions from Chinese coal plant powered manufacture, to which should be added the environmental cost of rare mineral and mercury mining, and the energy use and emissions of low grade bunker oil powered ship transport of such bulbs around the world, and then the recycling energy and emissions (as applicable, and when the bulbs are not merely dumped) as also covered on the Ceolas site. including of rare earth minerals from Africa to component manufacture, and in turn of components to the assembly plant, as well as transport to point of sale, given that local manufacture is less likely of the patented complex alternatives, as covered in point 13 below. Only the assembly energy amount is commonly acknowledged, and compared with energy consumed by light bulbs in their actual usage. The reason is that it is hard to ascertain figures for all the other mentioned life cycle stages that involve energy use and emissions. But they should of course be acknowledged in overall energy/emission assessments. The comparatively easy local environmentally friendly manufacture of simple incandescents should therefore be noted, as further covered below under sustainability argumentation. 7. "But Governments talk of savings from 19% lighting usage in society!" Politicians like big figures for journalists to quote in catchy headlines. That includes "million-billion" energy/emission/money savings, carefully crafted to some distant future date (2020, 2030, 2050). It also includes using deliberately misleading statistical data. The 19% figure as quoted by the US Government (and similarly in the EU and elsewhere) can be seen directly from Dept of Energy data, http://ceolas.net/#li171x. • It is 19% lighting usage of commercial and residential sectors only, ignoring industry and transport sectors. Since industry and transport involve relatively little lighting, their proper inclusion significantly pushes down the "lighting as a percentage of electricity use"! • The commercial sector in turn includes "commercial and institutional buildings and public street and highway lighting", hardly any of which involves lighting affected by the regulations! Again, such use suitably bump up the numbers - without anyone noticing, or bothering to check. Similarly, when talking of "lighting percentage of domestic usage" (typically by UK and Scandinavian politicians in justifying bans), one should therefore remember the lighting percentage of all society electricity usage, in what is supposedly a society saving law. Finally, since replacements also use electricity, a lighting usage percentage is of course not an actual saving percentage anyway. 8. "But at least home consumers will see great money savings on their electricity bills!" "Lighting is 15% of home electricity consumption!" Following on from the last point, probably the most common political defense towards citizen voters is how much money they save, thanks to their kind governments banning what those citizens would otherwise (in their presumable stupidity) have chosen to buy. Where cost savings are suggested (eg in USA or EU) this is seen to be based on the most commonly used light bulbs. But there are many light bulbs that are rarely used in 20+ (Europe) or 40+ (North America) lighting point households, giving no realistic savings except in the very long run (if staying in the same location) when using the more expensive replacement bulbs, that might also get lost or break before use, or be seen to be "dud". Also ignored are the changes of fixtures, fittings, control systems, dimming, sensors that may be involved. Assumed money savings would obviously vary a lot anyway, from household to household in bulb use, as well as from a variable bulb replacement price, electricity price etc. Hence the roundabout statement in EU, Canada, USA etc that lighting is 10-15% of home electricity consumption, by way of emphasizing supposed savings. A longer rundown dealing with money saving arguments can be seen from ceolas.net/#li12x onwards. The first obvious problems with a percentage lighting statement is of course that not all household lighting is incandescent, and that replacement lighting itself uses electricity. The most often used household lighting is usually in the kitchen, often already a fluorescent tube, recessed LEDs, etc - rarely incandescent in modern homes, and becoming rare in old ones, and being up to 50% of domestic lighting use as per some sources. Hence, no replacement saving. Then the points from the previous section where a lack of energy usage saving also translates into a lack of money saving, as in rebound/compensatory increased use of cheaper or under-performing lighting, and the heat contribution of incandescents, as further covered shortly. In addition, the low so-called "power factor" (not the same as power rating) of ordinary "energy saving" fluorescent bulbs means that they in layman terms use twice the energy compared to what the CFL bulb or your meter says, albeit that new regulations (eg in the EU) are seeking to toughen the allowable power factors. http://ceolas.net/#li15eux, with references, including Sylvania/Osram factsheet admission about the energy usage of common CFLs. That is not all, since LEDs for domestic use also have power factor issues and other issues affecting usage savings. Electricity consumers of course have to pay for this "hidden cost" in higher bills - especially in large scale pushed transitions to the alternative bulbs, which also require alterations to the domestic grids. Electrical Construction & Maintenance Magazine: The Hidden Costs of CFLs. Environmentalist engineer Paul Wheaton on CFLs and their lack of energy savings. Heads we lose - Tails they win! 9. "But incandescents waste 95% of their energy as heat!" Proponents conveniently "forget" to add that CFLs and LEDs really waste energy as heat, CFLs 80% and LEDs 55-70%. That is because the CFL/LED heat is internalized, to give a greater, unseen, unpredictable fire risk, particularly with CFLs (incandescent heat being more noticeable, to warn users). The incandescent heat "waste" is therefore a useful side-effect in temperate climates, given that when its dark it's often cold. The energy savings from the lesser use of other room heating is shown by much institutional research, as referenced, http://ceolas.net/#li6x. Of course, when the ordinary room heating is not electric, that saving will not show up on the electricity meters. Conversely, while incandescent use decreases the effect of air conditioning cooling, it is of course optional, and might still be preferred for light quality and other reasons. These sort of "energy guzzling heat wasting" statements are of course intended to show incandescents as a useless wasteful lighting choice. but "efficiency" is as mentioned not just about "energy efficiency": It is much easier and cheaper to construct a bright incandescent light bulb than a bright CFL or LED bulb. What exactly is a "waste" of energy? A product unnecessarily left on is a waste of energy. The personal choice of what product to use is not a waste of energy. Even less so when using electricity, of there is no future source shortage. 10. "It's time to replace 100 year old incandescent technology!" "Lovers of old lamps don't understand what progress means!" Firstly, if it ain't broke, don't fix it. Secondly, old technology can have usage advantages. Energy saving is not the only "progressive" advantage a product can have. Incandescent lighting, including "old" simple regular incandescent lighting, has several specific usage advantages. Thirdly, liking the old does not exclude liking the new. People can like new lighting too. It does not mean that such technology is suitable everywhere, for all uses. Progress is therefore welcomed - not feared. True progressive politics brings more choice and more advantages, a progress helped - not hindered - by allowing competition against that which already exists. This includes achieving better energy saving products, as mentioned before and as returned to in the last point here. 11. "But society is full of product standards! Manufacturers stopped making 8 track music systems, LPs, cassettes, and much else, whatever about consumer wishes!" Certainly, but they were not banned. do not preclude people buying, making, importing older products or product versions - products which may retain certain advantages. "Energy guzzling" radio tubes/valves and "energy saving" transistors are a good case in point, also because of the similarity of incandescents to tubes, and of LEDS (light emitting diodes) to transistors. The tubes were not banned, and still retain a usefulness for some applications. The ban on incandescents may not matter to those who (somewhat dimly!) simply want to light a room. But for those more sensitive to lighting used, whether for ambience, or for artistic, health or photographic reasons, it is a more serious matter. Photographers and film-makers can particularly be put out by the unpredictable and limited color rendition of CFLs and LEDs with their spiky emission spectra. such as obligatory energy ratings, can usefully inform consumers of product qualities, and aid international trade. (a particular problem in the already control-oriented EU, as also seen in relation to safe but "misshapen, wrong sized" food items and much else that is safe, which could of course still be traded voluntarily, ungraded etc). Here we arguably have the opposite, given new complex CFL/LED usage concerns, and given the "old" well known alternatives! Even if the energy savings were there, why should Government tell people how they can or can't use the electricity they pay for? and lead to increased demand for energy saving products (compare with oil prices and cars). 12. "The safety scares of new technology are overblown!" "CFL mercury? Look at tuna fish mercury, look at the greater coal plant mercury emissions caused by incandescents!" "New LED bulbs are the solution for worries over other light bulbs!" "Scare stories" in the press are frequently overblown. and even Halogen incandescent bulbs have potential Bromine and Iodine gas issues. LED point source glare and CFL/LED blue light problems have also come under increased scrutiny. have been the main proposed replacement given the development issues surrounding LEDs to give omnidirectional bright light at a reasonable unsubsidised (or even subsidised) purchase price. The most persistent complaints have surrounded CFL mercury content. If there is a Problem - Deal with the Problem. As it happens, the coal plant story is a bit of a folk tale by now, see end of the coal section above, covering the new emission reduction regulations from using new technology. It never was true anyway, and had it been, then comparatively the release from a broken bulb in a room would tend to be a greater worry to those affected than the release from a distant chimney - also from the extensive EPA, DEFRA and other official CFL mercury clean up and disposal recommendations referenced. The hidden environmental impact of billions of dumped fluorescent bulbs worldwide leeching mercury is only now beginning to concern legislators. To keep the points here clear and reasonably compact, the CFL radiation and other issues won't be referred to further. However, the biological/psychological effects of lighting should also be emphasized - not just the direct safety issues. Incandescent broad spectrum lighting, veering towards the "warm" red part of the spectrum, has been a "natural" evening replacement for the similar light from burning gas, candles, or open fires, for thousands of years. Suddenly mankind is using more neon, fluorescent (CFL), phosphorescent (white LED) lighting instead, with more blue light content, even in "warm" color temperature adjusted versions - and moreover, with more uneven spectra, so that unlike with incandescents, some colors are missing in the light given out. The issues have been particularly well researched in Germany, as also covered in the recent Austrian film Bulb Fiction, for example by Dr Alexander Wunsch (more, Google translated). Also see the well illustrated Gluehbirne.ist.org articles on light spectrum from different lamps and effects, example (Google translated version). Also see the extensive well referenced Greenwashing Lamps blog post on blue light issues. to first of all continue with light radiation issues, the American LEDs magazine has good coverage, for example this issue. Eva Chamorro et alia Madrid university research 2012 also here: Exposure to LED light, especially blue light and under prolonged exposure, harms retinal pigment epithelium cells. "Future studies are now needed to ascertain which intensities, wavelengths and exposure times of LED lighting devices are lethal and non lethal for retinal tissue." ANSES, French official health agency, did a major cross-disciplinary research 2010, with specific recommendations on EU regulations - 2013 updated English report. "it was found that Standard NF EN 62 471 is not entirely suitable for LED-based lighting because exposure limits are not appropriate, measurement protocols are ambiguous, and certain sensitive populations are not taken into account..."
Apparently the recommendations have not been taken up on lack of commercial viability. Meanwhile, it's not just CFLs that have content toxicity and environmental issues...such as rare earth mineral depletion. "The Dark Side of LED Lightbulbs"
Scientific American article on research by Department of Chemical Engineering and Materials Science, University of California, USA concerning the toxicity of LEDs. The CFLs and LEDs have higher resource depletion and toxicity potentials than the incandescent bulb due primarily to their high aluminum, copper, gold, lead, silver, and zinc. According to California regulations, excessive levels of copper (up to 3892 mg/kg; limit: 2500), Pb (up to 8103 mg/kg; limit: 1000), nickel (up to 4797 mg/kg; limit: 2000), or silver (up to 721 mg/kg; limit: 500) render all except low-intensity yellow LEDs hazardous"
13. "But the major light bulb manufacturers sought and welcomed this ban!" Manufacturers are happy to switch to production of energy saving lighting, "to save the planet". Except, of course, that they "need" to make sure no popular cheap competition is allowed. Why do they welcome being told what they can or can't make? Would you welcome being told what you can make? If so, why? Price and lifespan are of obvious importance in profiting from the sale of any disposable product. GE, Osram, Philips manufacturers already cooperated to ensure profitability from short lifespans. The Phoebus cartel ensured that the 1000 hour standard incandescent lifespan endures today. Even early in the 20th century incandescents lasting several thousand hours were routinely made, and today incandescents at relatively low cost lasting 20 000 hrs or more are made for industry (eg mining) but kept away from ordinary consumer outlets. More in the online documentary The Light Bulb Conspiracy, with background documentation. Now, the major manufacturers turn to higher price, admitting a greater profitability from CFL/LED sales, as documented and referenced, also regarding the lobbying activities. Unsurprisingly, as referenced, independent testing is showing that the supposed long - less profitable - CFL/LED lifespans are unlikely to be realized, also from the lack of real life similarity to the lab specifications used, and "Energy Star" and similar warranties do not have anything near such lifespan guarantees. Of course, no need to worry about consumer complaints in a few years time, when the ban is long since achieved, and promises have conveniently been forgotten. An old cheap generic relatively unprofitable patent-expired product. As a simple online search will show, the fight is on, for profitable patents of CFL and LED technology - technology that governments helpfully ensure that citizens against their will have to buy (or no incandescent ban would be needed). The issue of manufacturer support for government policies of lighting replacement with more profitable complex expensive alternative offerings of those manufacturers and of their assembly allies in China, is also well documented by Michael Leahy and Howard Brandston in their 2011 e-book "I Light Bulb", in particular from the American angle. Congress lighting consultant Brandston was there personally, in political meetings leading up to the 2007 legislation. When I asked NEMA for help in fighting the incandescent light ban, I was politely told that they could not be involved in any research program like that"
As it happens, successive GE CEO's have been involved as chief advisers to the Bush and Obama administrations. There is nothing wrong in manufacturers seeking profits through transparent open lobbying - what is wrong is handing them the profits on a plate. Politicians should if anything do the opposite, seek to increase rather than reduce competition on the market - a competition stimulation which of itself leads to new desirable products, as it always has, and also happens to reduce society energy use more effectively than regulations, see point 14 below, under market competition. Energy saving products can still be helped to market - and the better priceworthy ones survive. Similarly if new manufacturers of incandescents were encouraged, then longer lasting incandescents could break the monopoly of the short lasting types by the market controlling major manufacturers. "The Unholy Alliance between Philips and the Greens" Joost van Kasteren and Henk Tennekes, Dutch engineer and tech researchers, on how Philips sought a profitable ban under pretence of saving the planet. "Philips, Osram, the UN and the World Bank: How we will en.lighten the World in 2012"
How Philips and Osram will offload unwanted expensive products on developing countries with public assistance and payment. The EU ban legislating European Commission acknowledged the thousands of European light bulb manufacturing job losses resulting from the ban http://ceolas.net/#li21x. Similarly, American jobs have already been lost from plant closures. The pushed CFL and LED replacements are principally made in China (in whole, or as components for assembly and re-branding in the USA, EU and other importing countries). Incandescent-related jobs with major manufacturers may eventually have been lost anyway, but regulations hasten the move, and it should be noted that any light bulb manufacture start-up is made less likely when it must meet energy usage standards that make the light bulbs (incandescent or otherwise) more complex and difficult to make. Notice how all the factors of previous points come together. Simple products easily locally made using less energy and emissions, if need be long lasting without recycling requirement, compared to complex rare earth mineral depleting patented alternatives that are less easily locally made and involve more mining, component manufacture, product assembly, and recycling - when they are not dumped, giving described problems such as with CFL mercury. In particular, all the extra transport energy and emission usage in each of the above stages, including dirty bunker oil fuelled ships bringing products or parts from China. In addition, an electricity usage that is small and largely off-peak and therefore electricity that is available anyway and which, if emission-free, may actually lead to an increase in emissions with replacement bulbs and room heating from oil or other potentially pollutant sources. The "green" choice is, at the least, open to debate. "Incandescents as the Real Green Light Bulbs"
14. "But we should still target light bulb use!" Why are simple incandescent light bulbs being banned? They are not being banned for being unsafe to use, like lead paint. 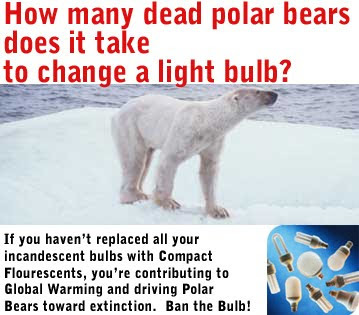 No, the reason for banning bulbs is simply to reduce energy consumption. "We are not banning the bulbs, we are setting energy usage limitations on them!". So, if any light bulb policy at all is needed (doubtful), there are better alternatives, based either on taxation or, better still, the increase of market competition. Taking a "liberal" left-wing stance, how do governments usually reduce consumption, at least outside the USA? say on coal, electricity from coal, any electricity, or on individual products, to appropriately reduce energy consumption, compared to legislating what consumers can or can't buy and use. Buildings, cars, TV sets, washing machines etc as well as light bulbs have or will increasingly have bans on them, based on energy use, in the USA, the EU, and probably elsewhere, on current plans. 1 1/2 - 2 billion annual pre-ban sales of relevant incandescent light bulbs in the USA as in the EU shows the potential Government taxation income from them alone. What do regulations give governments in direct income? Nothing. in that tax money can also go to lower the prices of energy saving alternatives. It is much easier to implement and to alter taxation, and easier to flexibly apply it to new products that change the market situation, than clumsy one-set-standard regulations that need to have complex bureaucratic worked-out replacements - as seen from current elaborately defined regulations! It is also easier to remove taxation when deemed no longer to be needed (eg when sufficient low emission energy is available), without having to restart the abandoned manufacture of products, as with regulation. Taxation is still wrong and unnecessary, for similar reasons to regulations. They are just a better alternative - arguably also for those who now favor regulations. Firstly, because electricity producers, just like manufacturers, are then more keen to keep down their own energy usage and cost. Secondly, because manufacturers are also pushed to deliver energy and cost saving products that the public actually want (and have always wanted, and do buy, even when costing more, and can imaginately be marketed for their savings in usage as described above - rather than to lobby regulators for easier profits through bans on cheap competition). New inventions - energy saving or with other advantages - can always be helped to the market, though not continually supported. Contrary to common political propaganda, innovation does not necessitate banning what has gone before! On the contrary, product innovation - whether with buildings, cars, washing machines or light bulbs - is proven as desirable, in direct comparison and direct competition on the market place. A progress seen throughout history also of new energy saving alternatives, like the invention of fluorescent and LED lighting - without regulations. The general advantages of stimulating competition are covered in the website introduction http://ceolas.net/#b1x and competition related to electricity generation and distribution is covered in sections that follow from that. How many politicians or bureaucrats should it take to change a light bulb? How many citizens should be allowed to choose?